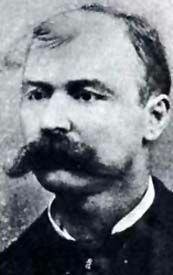 William “Red” Angus (1849-1922) – Johnson County, Wyoming Sheriff, Angus was involved in the Johnson County War that arose between the owners of large and small ranches in the area. Born in Zanesville, Ohio, Angus served as a military teamster in Kansas and briefly joined the Kansas Volunteer Cavalry. He was with General Custer, when he assaulted Black Kettle’s village at the Battle of the Washita in Oklahoma in 1868. Afterwards he continued to drive wagons in Indian Territory. In 1880 he was driving a herd of cattle from Texas to a ranch near Sheridan, Wyoming and upon his arrival, decided to stay. Some eight years later he was running a liquor store in Buffalo, Wyoming and one the Sheriff’s election of Johnson County in 1888. Sitting in the midst of cattle country, Angus sided with the small ranchers in the Johnson County War. When the cattle barons put to group of some 50 men together to intimidate the small ranchers, Angus gathered up his own posse and laid siege to the ranch where they were holed up. For three days, in April, 1892, a hail of bullets flew between the two factions, until the Sixth Cavalry from Fort McKinney were brought in to end the affair. When Angus ran for sheriff again the next year, he lost but stayed in Buffalo where he worked at the Occidental Hotel, served as a Deputy County Clerk and Johnson County Treasurer before his death in 1922.